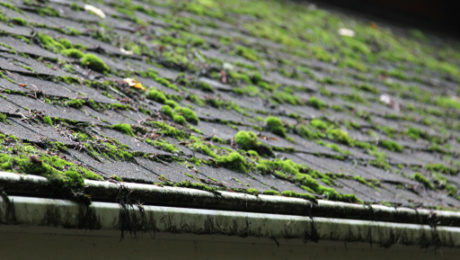 Moss on your roof is not something you want to ignore. While it might give your house that fairytale-cabin look, the damage moss causes to shingles is no fantasy. Moss breaks down shingles, whether they’re made of asphalt, wood, metal, clay or concrete, and reduces the lifespan of the roof as a whole. Moss damages roofs because it allows water to get under the shingles, which it accomplishes by lifting the shingles as it grows. It also lets in water as it freezes and expands as the weather changes. It furthermore breaks down shingles with its rhizomes (root-like structures), which it sends into the shingles material to help it stay put and absorb nutrients. When water gets under the shingles, it rots and distorts the wooden roof material, and it can encourage mold growth in the attic area. Eventually, roof leaks will spread past the attic into other areas of the house, causing more damage. The good news is that it’s possible to remove moss and prevent it from returning. Your first option for getting rid of moss is simply to have a professional roofing contractor replace the shingles. While this is the costliest measure, you might consider it if your roof is getting close to its life expectancy or has undergone considerable damage. Algae- and moss-resistant shingles are available. These shingles, available from a number of manufacturers, have copper, zinc, or titanium-dioxide granules, which help inhibit the growth of algae and moss. However, while these shingles “resist” or “relieve’ unwanted growth, their manufacturer warranties for resistance are far shorter than for the lifespan of the roof. As granules wash off over time, the ability of the roof to resist algae and moss growth diminishes. A less expensive, though time-intensive, option is to remove the moss yourself. To do this, you can purchase one of many sprays and powders available at a hardware store or online. Follow the instructions to kill and remove the moss. After you’ve generously applied your spray and have let it soak for several hours, scrub off the dead moss with a nylon brush. Make sure to brush down — not up — so you don’t accidently pull up shingles. Do not scrape, scour, or pound the shingles, either. You do not want to damage your roof. After scrubbing, rinse off the roof with water from a hose. Make sure to spray at a down the angle of your roof (for the same reason you should brush down and not up). We suggest putting buckets under your downspouts to collect the runoff while you do this. The solution you sprayed onto the moss will kill the plants underneath the spouts and contaminate the soil. It can also can discolor siding, paths, etc. Make sure to dispose of the water properly. If you decide to clean the roof yourself, DO NOT use a pressure washer. The pressurized water will tear off granules and shorten the life of your roof. It also will not kill the moss where it’s most damaging — between shingles. Plus, the moss will return after you’re finished the chore. It’s always possible to hire someone else to do the job you’d prefer not to do. A handyman or contractor will apply a chemical solution to the roof and clear it off like the steps above explain. Besides installing algae-resistant shingles, there are a couple of things you can do to ward off unwanted growth. The first of these is to install 6-inch-wide strips of copper or zinc under the row of shingles closest to the roof, leaving 1 or 2 inches of the strip exposed to the weather. When it rains, molecules from the metal strips will wash down the roof, creating an environment that discourages algae and moss growth. Also consider trimming back tree branches or removing trees growing close to your home. Moss thrives in shady areas. The shade blocks the moss from harmful UV rays and prevents water from evaporating as quickly, which is what moss needs to survive. Ensuring your roof receives full sunlight is the best thing you can do to help prevent moss from growing.